One of the first of the 2014 Schleich World of History dinosaurs to be reviewed by team members at Everything Dinosaur is the new, light green T. rex figure from the German manufacturer. Schleich have made a number of replicas of what is perhaps the most famous dinosaur of all and this new addition to their prehistoric animal model range is bound to prove popular with young dinosaur fans. This is the second, large-sized Tyrannosaurus rex model in the World of History series, when compared to the 2012 T. rex, this model is fractionally smaller, the earlier model measuring around 28 centimetres from nose to tail, whilst the 2014 Tyrannosaurus rex measures about 27 centimetres in length. Apart from the obvious colour difference, the actual pose is slightly different with the head turned more to the left and the slightly longer tail is raised upwards. As with the earlier T. rex model, the lower jaw is articulated, so this dinosaur can be posed with its mouth open or closed, or indeed posed in any position in between. When the jaws are opened, the care attention taken over the painting of the mouth area by the artists at Schleich can be clearly seen. 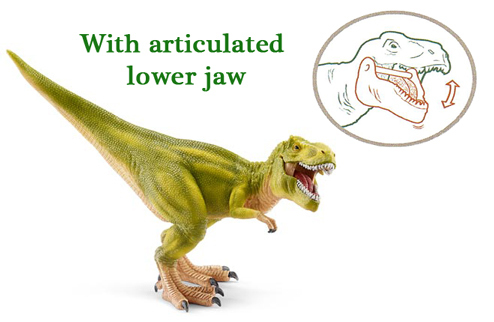 A moveable lower jaw on this T. rex dinosaur model. The model is very well balanced and it is ideal for creative play, although as with the majority of the Schleich dinosaur replicas that represent bipeds, the hind feet are a little oversized. The large feet permit this dinosaur model to be posed with the tail raised off the ground, the anatomically correct position. It seems that Schleich have had to trade off having slightly bigger feet on their meat-eating dinosaur models against being able to portray them in more dynamic poses. The texture of the skin with its scales and skin folds has been beautifully rendered. There is a lot of fine skin detail to admire, even individual rounded scales along the flank can be picked out. The level of detail is also reflected on the underside of the model, an area of some replicas often neglected, but this is not the case with this new Schleich T. rex. The skull is particularly well modelled with individual wrinkles around the nostrils depicted along with accurate representations of the skull morphology complete with its fenestrae and lumps and bumps. Intriguingly, this dinosaur’s eye is black, with no obviously definition such as an iris. This gives this T. rex quite a menacing, frightening look, especially when light reflects off the highly glossy black paint of the eye to give the impression of a white pupil. As this replica measures approximately 27 centimetres in length, by our estimates this makes this particular model something like 1:50 scale. The model is very robust, it almost has a waxy feel to it and it would be a great T. rex model to encourage creative, imaginative play. These two World of History T. rex models work well together, perhaps the bigger figure could represent a larger, mature female and the slightly smaller, light green model a male, her mate. For scientists believe that, just like many of today’s birds, female T. rexes were bigger than the males. Here is another opportunity for model collectors and dinosaur fans to acquire another interpretation of Tyrannosaurus rex and there is a lot to commend this particular Schleich replica. Everything Dinosaur even includes a T. rex fact sheet that we send out with all our sales of Tyrannosaurus rex dinosaur models.